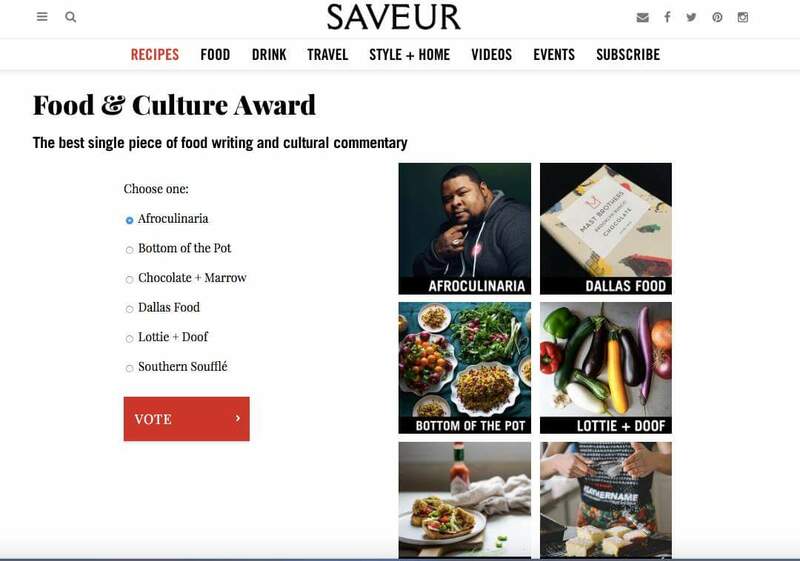 Vote for Afroculinaria for the Saveur Blog Awards 2016! I am pleased to announce that http://www.Afroculinaria.com has been nominated for a Saveur Blog Award! Afroculinaria is under the Food and Culture Blog category. Specifically my letter to Sean Brock was nominated. Please vote for me, it’s free! You can vote everyday, once a day until August 31st. This will be such a great opportunity if we achieve this! Please consider voting for The Culture of Collards as well in the Video category! Please be sure to also share this blog post or the voting page far and wide, especially on Facebook, Twitter and Google+. Update to the story–both Sean Brock and Jeff Allen and I have talked and agree that we have more in common than we don’t, we are also working towards healing and reconciliation so that we can create a more just and prosperous culinary scene for us all. I spoke with Chef Brock on the phone and we continue to be in touch. Jeff Allen and I sat down to a meal face to face and got a chance to figure out the real issues behind our frustrations. I believe that its easy to have misunderstandings but it betters us all to have civil conversation human to human and examine our common aims. Peace has been made, progress is on the way. Somewhere in America, there is sanity. Woo hoo! And I totally feel you could win!!!!! Hopefully Jeff Allen issues you a public apology on Twitter. If he could sit there and make such repugnant, ignorant remarks to you for all to see, he needs to apologize for all to see. I’m never down for private apologies for public behavior. Im rooting for your … stay encouraged, loving what you are doing, thank you soooooo, much!!! He is the only African American food historian that I am aware of doing what he is doing: educating about our food from before slavery, during slavery and current history …. let us try to support him, share this with your friends and let’s see if we can get this award for him!